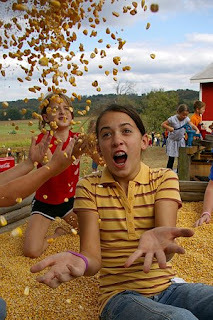 I love Shannon's expression - and how she took joy in something small - a "sand box" filled with corn. And while it takes courage to achieve greatness, it takes more courage to find fulfillment in being ordinary. For the joys that last have little relationship to achievement, to standing one step higher on the victory platform. So, maybe this is part two....finding gratitude in the ordinary. It is daring to find the gratitude in the small things. It is celebrating the small miracles and small wins - it is having the courage to be ordinary. They don't write books about the ordinary, but it's the ordinary, small things that can make a life-long impact. Maybe I need to remember that - that the ordinary, the small things I do in the ministry are what make the most difference.